Hollywood Classics - Welcome to Our Generation USA! ​along with the Film Industry that began in and adjacent to Hollywood, California, including Actors, Movies and other works originating from that classical Hollywood period. The cinema of the United States, often generally referred to as Hollywood, has had a profound effect on cinema across the world since the early 20th century. 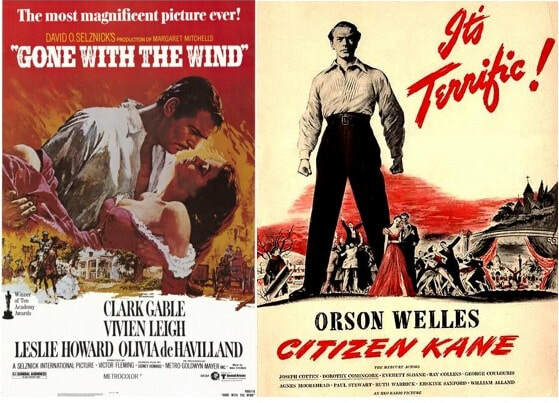 The dominant style of American cinema is Classical Hollywood Cinema, which developed from 1917 to 1960 and characterizes most films to this day. While the French Lumière Brothers are generally credited with the birth of modern cinema, it is American cinema that soon became the most dominant force in an emerging industry. Since the 1920s, the American film industry has grossed more money every year than that of any other country. The United States was in the forefront of sound film development in the following decades. Since the early 20th century, the U.S. film industry has largely been based in and around Hollywood, Los Angeles, California. Picture City, Florida was also a planned site for a movie picture production center in the 1920s, but due to the 1928 Okeechobee hurricane, the idea collapsed and Picture City returned to its original name of Hobe Sound. Director D. W. Griffith was central to the development of film grammar. Orson Welles's Citizen Kane (1941) is frequently cited in critics' polls as the greatest film of all time. and Star Wars: The Force Awakens (2015). Today, American film studios collectively generate several hundred movies every year, making the United States one of the most prolific producers of films in the world. During the "golden age" of Hollywood, The Big Eight referred to the eight major Hollywood movie studios. Since then, the number of major studios has fluctuated; with bankruptcies (RKO Radio Pictures), mergers (United Artists), downsizing (MGM) and the promotion of what was previously a minor studio (The Walt Disney Company), as of 2018, there is currently a Big Six. 20th Century Fox - now owned by 21st Century Fox. Columbia Pictures - now owned by Sony. MGM (Metro-Goldwyn-Mayer) - now owned by MGM Holdings. Paramount Pictures - now owned by Viacom. RKO Radio Pictures - defunct c. 1957. United Artists - purchased by MGM, a subsidiary of MGM Holdings. Universal Studios - now a part of NBCUniversal, a division of Comcast. Warner Bros. - a division of Time Warner. Nestor Studio, Hollywood's first movie studio, 1912By 1912, major motion-picture companies had set up production near or in Los Angeles. In the early 1900s, most motion picture patents were held by Thomas Edison's Motion Picture Patents Company in New Jersey, and filmmakers were often sued to stop their productions. To escape this, filmmakers began moving out west, where Edison's patents could not be enforced. Also, the weather was ideal and there was quick access to various settings. Los Angeles became the capital of the film industry. Director D. W. Griffith was the first to make a motion picture in Hollywood. His 17-minute short film In Old California (1910) was filmed for the Biograph Company. Although Hollywood banned movie theaters—of which it had none—before annexation that year, Los Angeles had no such restriction. The first film by a Hollywood studio, Nestor Motion Picture Company, was shot on October 26, 1911. The H. J. Whitley home was used as its set, and the unnamed movie was filmed in the middle of their groves at the corner of Whitley Avenue and Hollywood Boulevard. In 1923, a large sign, reading HOLLYWOODLAND, was erected in the Hollywood Hills. Its purpose was to advertise a housing development. In 1949, the Hollywood Chamber of Commerce entered a contract with the City of Los Angeles to repair and rebuild the sign. The agreement stipulated that "LAND" be removed to spell "HOLLYWOOD" so the sign would now refer to the district, rather than the housing development. After years of serious decline in the 1980s, many Hollywood landmarks were threatened with demolition. Columbia Square, at the northwest corner of Sunset Boulevard and Gower Street, is part of the ongoing rebirth of Hollywood. The Art Deco-style studio complex completed in 1938, which was once the Hollywood headquarters for CBS, became home to a new generation of broadcasters when cable television networks MTV, Comedy Central, BET and Spike TV consolidated their offices here in 2014 as part of a $420-million office, residential and retail complex. Since 2000, Hollywood has been increasingly gentrified due to revitalization by private enterprise and public planners. Mexico (21.3%) and Guatemala (13%) were the most common places of birth for the 53.8% of the residents who were born abroad, a figure that was considered high for the city as a whole. The median household income in 2008 dollars was $33,694, considered low for Los Angeles. The average household size of 2.1 people was also lower than the city norm. Renters occupied 92.4% of the housing units, and home- or apartment owners the rest. In 2000, there were 2,828 military veterans, or 4.5%, a low rate for the city as a whole. On January 22, 1947, the first commercial television station west of the Mississippi River, KTLA, began operating in Hollywood. In December of that year, The Public Prosecutor became the first network television series to be filmed in Hollywood.Television stations KTLA and KCET, both on Sunset Boulevard, are the last broadcasters (television or radio) with Hollywood addresses, but KCET has since sold its studios on Sunset and plans to move to another location. KNBC moved in 1962 from the former NBC Radio City Studios at the northeast corner of Sunset Boulevard and Vine Street to NBC Studios in Burbank. KTTV moved in 1996 from its former home at Metromedia Square on Sunset Boulevard to West Los Angeles, and KCOP left its home on La Brea Avenue to join KTTV on the Fox lot. KCBS-TV and KCAL-TV moved from their longtime home at CBS Columbia Square on Sunset Boulevard to a new facility at CBS Studio Center in Studio City. The annual Hollywood Christmas Parade: The 2006 parade on Nov 26 was the 75th edition of the Christmas Parade. The parade goes down Hollywood Boulevard and is broadcast in the Los Angeles area on KTLA, and around the United States on Tribune-owned stations and the WGN superstation.The Hollywood Half Marathon takes place in April (since 2012) of each year, to raise funds and awareness for local youth homeless shelters. The event includes a Half Marathon, 10K, 5K, and Kids Fun Run along Hollywood Blvd. YouTube Video: From "Gone with a Wind": "Frankly, my dear, I don't give a damn"
YouTube Video: Trailer from "Citizen Kane"
Classical Hollywood cinema, classical Hollywood narrative, and classical continuity are terms used in film critique which designate both a narrative and visual style of film-making which developed in and characterized US American cinema between 1917 and the early 1960s and eventually became the most powerful and pervasive style of film-making worldwide. List of Movie Stars who have received their Star on the Hollywood Walk of Fame. Click here for a List of Actors who have received their Star on the Hollywood Walk of Fame. ​The Hollywood Walk of Fame comprises more than 2,600 five-pointed terrazzo and brass stars embedded in the sidewalks along 15 blocks of Hollywood Boulevard and three blocks of Vine Street in Hollywood, California. The Walk of Fame is administered by the Hollywood Chamber of Commerce and maintained by the self-financing Hollywood Historic Trust. It is a popular tourist destination, with a reported 10 million visitors in 2003. ​Hollywood Boulevard is a major east–west street in Los Angeles, California. It begins in the west as a winding residential street at Sunset Plaza Drive in the Hollywood Hills West district. After crossing Laurel Canyon Boulevard, it proceeds due east as a major thoroughfare through Hollywood, Little Armenia and Thai Town to Vermont Avenue. It then runs southeast to its eastern terminus at Sunset Boulevard in the Los Feliz district. Parts of the boulevard are popular tourist destinations, primarily the fifteen blocks between La Brea Avenue east to Gower Street where the Hollywood Walk of Fame is primarily located. Pictured below: The Hollywood Ten in November 1947 waiting to be fingerprinted in the U.S. Marshal's office after being cited for contempt of Congress. Front row (from left): Herbert Biberman, attorneys Martin Popper and Robert W. Kenny, Albert Maltz, Lester Cole. Middle row: Dalton Trumbo, John Howard Lawson, Alvah Bessie, Samuel Ornitz. ​Back row: Ring Lardner Jr., Edward Dmytryk, Adrian Scott. Artists were barred from work on the basis of their membership, alleged membership in, or sympathy with the Communist Party USA, or their refusal to assist investigations into the party's activities. Even during the period of its strictest enforcement, from the late 1940s through to the late 1950s, the blacklist was rarely made explicit or verifiable, but it directly damaged the careers of scores of individuals working in the film industry. The first systematic Hollywood blacklist was instituted on November 25, 1947, the day after ten writers and directors were cited for contempt of Congress for refusing to testify before the House Un-American Activities Committee. A group of studio executives, acting under the aegis of the Association of Motion Picture Producers, fired the artists - the so-called Hollywood Ten - and made what has become known as the Waldorf Statement. On June 22, 1950, a pamphlet entitled Red Channels was published. Focused on the field of broadcasting, it identified 151 entertainment industry professionals in the context of "Red Fascists and their sympathizers". Soon, most of those named, along with a host of other artists, were barred from employment in most of the entertainment field. The blacklist lasted until 1960, when Dalton Trumbo, a Communist Party member from 1943 to 1948 and member of the Hollywood Ten, was credited as the screenwriter of the highly successful film Exodus, and later publicly acknowledged by actor Kirk Douglas for writing the screenplay for the movie Spartacus. A number of those blacklisted, however, were still barred from work in their professions for years afterward. Hollywood Blacklist, series of interviews and transcripts (many online) from Center for Oral History Research, UCLA Library Special Collections, University of California, Los Angeles. Pictured below: Major Film Studios in (T) the San Fernando Valley; (B) Hollywood and the Westside. Click here for a List of Films by Studio. In the American and international markets, the major film studios, often simply known as the majors, are commonly regarded as the six diversified media conglomerates whose various film production and distribution subsidiaries collectively command approximately 80 to 85% of U.S. box office revenue. The term may also be applied more specifically to the primary motion picture business subsidiary of each respective conglomerate. The "Big Six" majors, whose operations are based in or around the Los Angeles neighborhood of Hollywood, are all centered in film studios active during Hollywood's Golden Age of the 1930s and 1940s. In three cases--20th Century Fox, Warner Bros., and Paramount Pictures—the studios were one of the "Big Five" majors during that era as well. In two cases--Columbia Pictures and Universal Pictures—the studios were also considered majors, but in the next tier down, part of the "Little Three". The sixth, Walt Disney Studios, was an independent production company during the Golden Age; it was an important Hollywood entity, but not a major. Metro-Goldwyn-Mayer, RKO, and United Artists were Golden Age majors that survive now only as relatively small independent companies or, in UA's case, a brand name. Disney is the only member of the Big Six whose parent entity is still located near Los Angeles (on Disney's studio lot and in the same building). The five others report to conglomerates respectively headquartered in New York City, Philadelphia, and Tokyo. Of the Big Six, Paramount is the only one still based in Hollywood proper; furthermore, Paramount and Fox are the only ones still located within the Los Angeles city limits, while Disney and Warner Bros. are located in Burbank, Columbia in Culver City, and Universal in the unincorporated area of Universal City. Most of today's Big Six control subsidiaries with their own distribution networks that concentrate on arthouse pictures (e.g. Fox Searchlight Pictures) or genre films (e.g. Sony's Screen Gems); several of these specialty units were shut down or sold off between 2008 and 2010. The six major studios are contrasted with smaller production and/or distribution companies, which are known as independents or "indies". The leading independent producer/distributors such as Lionsgate, STX Entertainment, and Open Road Films are sometimes referred to as "mini-majors". From 1998 through 2005, DreamWorks SKG commanded a large enough market share to arguably qualify it as a seventh major, despite its relatively small output. In 2006, DreamWorks was acquired by Viacom, Paramount's corporate parent. In late 2008, DreamWorks once again became an independent production company; its films were distributed by Disney's Touchstone Pictures until 2016, at which point distribution switched to Universal. The Big Six major studios are today primarily backers and distributors of films whose actual production is largely handled by independent companies—either long-running entities or ones created for and dedicated to the making of a specific film. The specialty divisions often simply acquire distribution rights to pictures in which the studio has had no prior involvement. While the majors still do a modicum of true production, their activities are focused more in the areas of development, financing, marketing, and merchandising. Those business functions are still usually performed in or near Los Angeles, even though the runaway production phenomenon means that most films are now mostly or completely shot on location at places outside Los Angeles. Since the dawn of filmmaking, the U.S. major film studios have dominated both American cinema and the global film industry. U.S. studios have benefited from a strong first-mover advantage in that they were the first to industrialize filmmaking and master the art of mass-producing and distributing high-quality films with broad cross-cultural appeal. Today, the Big Six majors routinely distribute hundreds of films every year into all significant international markets (that is, where discretionary income is high enough for consumers to afford to watch films). It is very rare, if not impossible, for a film to reach a broad international audience on multiple continents and in multiple languages without first being picked up by one of the majors for distribution. ​Pictured below: The Hollywood Studio System contributed massively to the success of film's as a whole. It allowed the largest studios of the time to control the majority of the film industry. ​The Hollywood studio system (which was used during a period known as the Golden Age of Hollywood) is a method of film production and distribution dominated by a small number of "major" studios in Hollywood. Although the term is still used today as a reference to the systems and output of the major studios, historically the term refers to the practice of large motion picture studios between the 1920s and 1960s of (a) producing movies primarily on their own filmmaking lots with creative personnel under often long-term contract, and (b) dominating exhibition through vertical integration, i.e., the ownership or effective control of distributors and exhibition, guaranteeing additional sales of films through manipulative booking techniques such as block booking. The studio system was challenged under the anti-trust laws in a 1948 Supreme Court ruling which sought to separate production from the distribution and exhibition and ended such practices, thereby hastening the end of the studio system. By 1954, with television competing for audience and the last of the operational links between a major production studio and theater chain broken, the historic era of the studio system was over. The period stretching from the introduction of sound to the beginning of the demise of the studio system, 1927–1948, is referred to by some film historians as the Golden Age of Hollywood. The Golden Age is a purely technical distinction and not to be confused with the style in film criticism known as Classical Hollywood cinema, a style of American film which developed from 1917 to 1963 and characterizes it to this day. Two majors--Universal Pictures and Columbia Pictures—were similarly organized, though they never owned more than small theater circuits. The eighth of the Golden Age majors, United Artists, owned a few theaters and had access to two production facilities owned by members of its controlling partnership group, but it functioned primarily as a backer-distributor, loaning money to independent producers and releasing their films. The Burbank Studios (formerly known as NBC Studios) is a television production facility located in Burbank, California. The studio is home to Days of Our Lives, the IHeartRadio Theater, and the Blizzard eSports Arena (home of the Overwatch League). Click on the blue hyperlinks below for more about Burbank Studios. During the "golden age" of Hollywood, The Big Eight referred to the eight major Hollywood movie studios. Since then, the number of major studios has fluctuated; with bankruptcies (RKO Radio Pictures), mergers (United Artists), downsizing (MGM) and the promotion of what was previously a minor studio (The Walt Disney Company), as of 2018, there is currently a Big Six. Metro-Goldwyn-Mayer, owned by MGM Holdings. Paramount Pictures, owned by Viacom. Universal Studios - part of the NBCUniversal division of Comcast. Warner Bros., part of the WarnerMedia division of AT&T. Click here for a List of Notable Residents.